F.S. Gr. 670.009 Cab forward with front platform. Steam Locomotive a double expansion. Water Tender with 3 axles. Oil lamps, air whistle. Black plates, ‘20 - Possibility to open : box cab, doors of the tender, water tanks. F.S. Gr. 670.018 Cab forward without front platform, extended cab. Water Tender with 3 axles. Oil lamps, Black plates, ’20 - Possibility to open box cab, doors of tender, water tanks. F.S. Gr. 671.011 Cab forward with front platform. Possibility to open : box cab, doors of the tender, water tanks. Differences between 670 and 671 : different valves on the cylinder block, conic front door, interior box cab, plates, some valves, heater system. F.S. Gr. 671.020 Cab forward without front platform, extended cab. The Italians also had a class of cab forwards, the Gruppo 670, late Gr.671 (43 were built), which were 4-6-0s with a six wheel tender for water only. The coal was carried in a bunker above and alongside the firebox. The front of a Gr670 4-6-0 Cab-Forward with the fire box was above the front bogie. 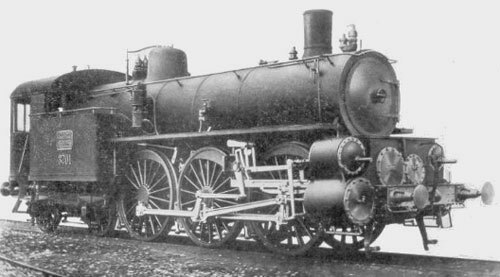 Steam Locomotive with double expansion. Steam Locomotive with double expansion, with over heat steam system. Valves “Papa” type. Increased the number of pipes of boiler. The 4-6-0 was a 4-cylinder compound on the Plancher system. There were two LP cylinders on one side, and two HP on the other. To fit them in, one LP cylinder and one HP cylinder was mounted between the frames. There was also a class of four cylinder 0-10-0s, also Planchers, built for banking duties north out of Genoa that were Tank engines with the coal supply located as on the Gr. 670, but all their water supply was carried in four wheel tenders that could be positioned at either end of the engine, so that sometimes they too were cab forwards. The rear of a Gr670 4-6-0, showing two LP cylinders this side, and two HP on the far side. The engines were four cylinder Plancher compounds and hauled passenger trains down the east coast of Italy. All the above engines were affectionately known by their crews as "Muccas" (Cows!). They were originally designed like that because of legislation that decreed that between loco and train there had to be an empty wagon, which wasn't helpful on steeply graded lines so the "tender" sufficed. Most of these were eventually converted to conventional tender engines, but 470.092 survived in original condition in the Science Museum in Milan. The tender was a cylindrical tank and carried only water. This loco was a four-cylinder compound with side coal-bunkers, which look rather small in capacity. Apparently coal was also carried on the roof. The difficulty of getting coal from a rear tender seems to have been the major disincentive to building the cabforward configuration. This 4-6-0 locomotive was designed in 1900, for the Southern Adriatic railway. A prototype was exhibited at the International Railway Congress in Paris. It must have been a success, because locos of this design were working the most prestigious Milan-Bologna expresses in 1922, and in 1932 were still working on the Milan-Verona-Venice run. They finally ceased work in the early 1940's. There was also a single Gr. 672 built that was similar, but was used to try out the Franco system of pre-heating the feed water. The Gr. 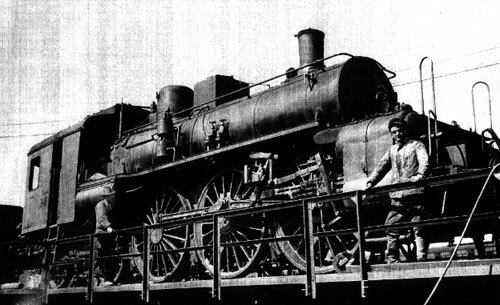 672 was a 671 adapted to the Franco - Crosti boiler system. The idea behind the Franco-Crosti boiler system was to make better use of the heat remaining in the exhaust. The firebox gases go through a normal boiler and then a preheater, which heats the feedwater before it reaches the boiler. Here a big pipe carries the hot gases from the boiler to the preheater which has replaced the tender. The exhaust steam from the cylinders is piped back to a blastpipe just below the chimney at the rear of the preheater. The Franco - Crosti Gr. 672 4-6-0 with its casing in place.